Connects2 have developed a full range of DAB interfaces. DAB stations can be selected from the vehicles steering wheel controls, allowing seamless DAB integration into your vehicle. Digital Radio solution for your car's factory fitting radio. AutoDAB seamless interface makes your factory radio able to receive DAB. Supports DAB, DAB+, DMB. 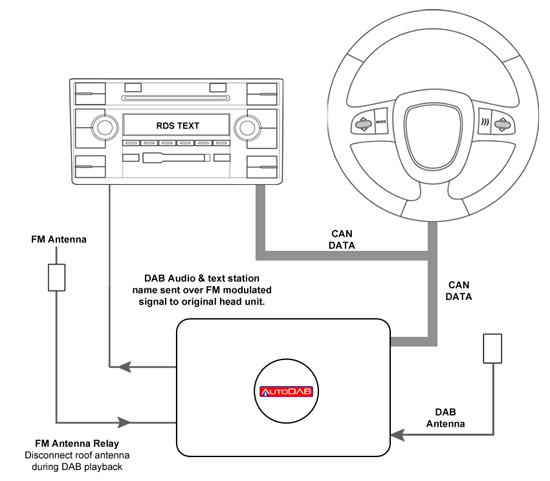 AutoDAB receives the digital signal from a DAB antenna and modulates it to the OEM radio installed in your car. With digital radio, you can get all the digital stations bringing you extra news, sport, music, comedy, drama, children's programs and more.